Dutch painter (also spelt Neveu). 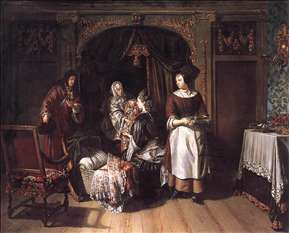 He was the son of a wine merchant from Rotterdam and began his training with Abraham Toorenvliet (c. 1620-92), a glass painter and drawing master in Leiden. 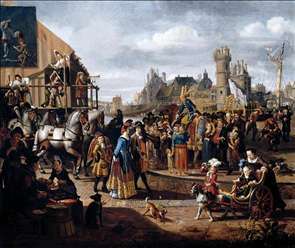 From 1667 to 1669 Naiveu was apprenticed to the Leiden Fine painter Gerrit Dou, who received 100 guilders a year (an exceptionally high sum) for instructing Naiveu. In 1671 Naiveu entered the Leiden Guild of St Luke, of which he became the head in 1677 and again in 1678, the year in which he moved to Amsterdam, where he was later appointed hop inspector. 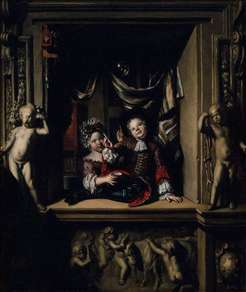 This work did not prevent him producing a considerable number of paintings; the earliest known work by Naiveu is dated 1668, the latest 1721. There are dated paintings for almost every year in between; his most productive periods were 1675-79 and 1705-12. 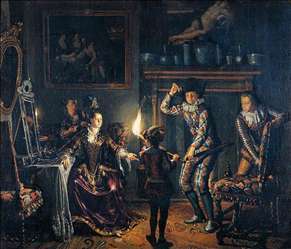 See more details about "Candle-Lit Interior"
See more details about "Carnival Scene"
See more details about "Visit to the Nursery"
See more details about "Boy and Girl Blowing Soap Bubbles"